My ideas about bird watching and photography are my own and they work for me. They will not work for everyone and people will disagree with some of my methods because they do things different ways. What works for one person is not always best for anyone else and there is no real wrong way to do things, as long as a few basics that should always be applied and adhered to are indeed applied and adhered to. Obey local laws and respect public and private property. This includes respecting signs on and off of trails and roads. Respect nature. This includes animals, plants, and inanimate objects like bodies of water, rocks, and human-made structures. Promote nature when you visit nature. Simply put, leave things as you find them. This includes trails, nests, and plant life. Follow photography ethics and unwritten rules. These can change person to person, but a good guide is available through the Audubon Society. These points are further elaborated on by the American Birding Association but should be applied during any time spent in nature. 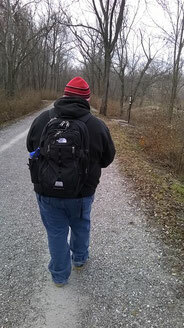 Staying on the trail, carrying everything I need including water, and generally being respectful. Richard Crossley has written that you have to either be a birder or a photographer when you go out into nature to look for birds. This idea can extend to other animals or nature in general. The power of observation is in the hands of the person that decides to go outside no matter how you see yourself. As an observer I have a number of points that I keep in mind as I am heading out. Be aware of where you are going and let someone know where you are going. I like to collect or download maps of the trails or general area I plan on going if maps are not available. It helps to bring along a friend that enjoys the hobby you are going out to partake in. If they enjoy only your company and not the hobby, that usually suffices as well. Know the terrain and its denizens. Understanding that you will be in hills, or that there might be poison ivy around, or that bobcats have been seen in the area will give you a heads up on what to prepare for. Rarely do you walk into a bobcat, but I have found myself a yard or two away from a deer in dense vegetation before. Eye to eye with a large animal, even when it is expected in that area, is alarming for both animals (you and the deer), so be prepared. Going with the last point, if your goal is to identify animals or plants, know what animals to expect. Also expect some unexpected animals. Animals do not respect the boundaries that are drawn in books. Don't be distracted by the world you are leaving. If you are going out to nature, for any kind of reason, enjoy nature. Cell phones and other devices are good for a variety of reasons (e.g. GPS, safety), but playing on your phone while you're out in nature is fairly counterproductive. My normal nature buddy. She generally hates me for a little while when I sneak a picture of her. Always look twice, but never stare. Animals don't like being stared down. Recognize feather patterns and colors (to the best of your abilities) in different areas. Important areas include the tail, face, and wings. Remember what kind of area the bird was seen in. The level of the plants, types of plants, area of a shoreline or the area of the water they are living in are important factors in identification. Shapes and sizes of bird bodies can be used to quickly narrow down tricky identifications. A hummingbird would never be mistaken for an eagle. Never ignore a "plain" or "common" bird. Even the always observable birds are interesting and unique. Do not ruin the experience for others by bragging or belittling what they have seen. Closely related, do not respond to anyone by starting "it's just a..." Every identification is a small puzzle that someone has solved and something they have personally seen, which is a small victory as well. Stay open to being corrected. Some birds (shorebirds and sparrows, we're looking at you) are ludicrously similar to one another and can be very hard to identify. Don't ever ignore a bird because you don't like it. Having favorites is one thing, but discounting an entire species because of personal preferences makes you miss interesting behaviors sometimes. Recognize behaviors of the animals that you want to photograph. Changes in behavior can tell you if you need to look away or snap a photo extremely quickly. Keep your distance. If the animals want to come to you they will. If they're dangerous you don't want them to anyway usually. Go digital. Film is wonderful and can produce beautiful images. However, digital allows for a lot of manipulation prior to even capturing images. Additionally, post capture editing can be done anywhere, instead of in a dark room. Digital photography also allows you to take more pictures than you will know what to do with. Digital storage is cheap and keeping thousands of photos is much easier on a hard drive than in a filing cabinet. Related, save your bad photographs. Sometimes knowing what you photographed, even if it is a bad angle shot or only shows some patterns of the wing or body, may be useful in the field in the future. Lenses don't make someone better. I have lenses of many different magnifications and they all have their drawbacks and advantages. Learn to use your equipment and it will take care of your images. Don't ever ignore a bird because you don't like it. Having favorites is good, but all animals are interesting. I have pictures of American Robins and Mourning Doves that are amazing. These get passed up a lot by photographers and bird watchers.